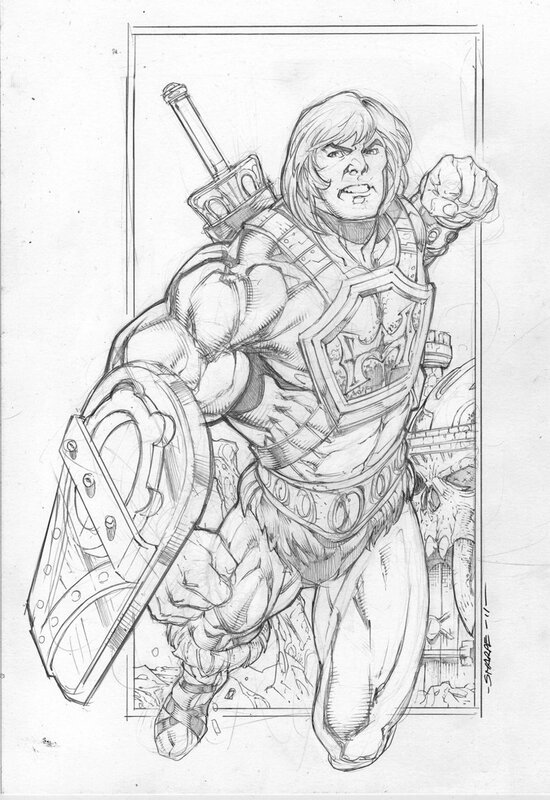 He-Man.org > News > Fewer 2012 Subs Sold Mean Lower 2013 Baseline and other questions answered! Fewer 2012 Subs Sold Mean Lower 2013 Baseline and other questions answered! Toyguru returns with the answers to the MOTUC fandom's various questions! MOTUC army builder 2-packs to return in 2012? Since the Club Eternia subscription for 2012 includes two $40 spots, I am remaining hopeful that one of those will be an army builder 2-pack. Perhaps something to bolster the ranks of the Evil Horde? I know you can't reveal any specific characters yet, but will MOTU army builders be happy with the 2012 subscription? At this point we are not commenting in anything past Thunder Punch He-Man. Wait and see! You mentioned re-evaluating the number of skus for 2013, which I'm assuming will be either less beasts/multipacks or less quarterly variants. Would the 30th anniversary sub, if it goes through, be a precursor to a potential tiered subscription for 2013? The 2012 six figure 30th line is its own thing which won't conitnue past 2012 anyway. It was always only for 2012 for the 30th. How 2013 is affected remains to be seen, but the overall lower baseline does not help our case to argue for line expansions. Just telling it like it is! MOTUC 2013 Sub - Fewer Sku's a Year or Fewer Sku's in Sub? Am I reading this right? You said that because of lack of sub. sales for MOTUC will cause you to drop sku's in 2013. Does this mean that you will do away with figures like A-list variants, beast, multipacks, etc. that are added to the 2013 sub.? Or does this mean that the 2013 sub. will be just like the 2010 sub. in which we will only get 1 figure a month in the sub. and "race" to Matty to get the A-list variant, beast class, etc.? I don't think the 2010 sub. worked at all because of this. I think the sub. sales for 2013 are down only because of the economy. The 2011 sub. has been great and I like being able to get everything together. What about a 2013 sub. that we can choose if we want an "all in" option or only the 1 $20 figure option? Maybe two different MOTUC subs? We are still evaluating 2013. What we know for sure is we will be backing off of additional non sub items in fall 2012 (beyond already announced Granamyr). The 2013 line is not final yet and we will wait to see how many day of (non sub) sales we get for the first few 2012 figures. But overall the drop in sub sales between 2011 and 2012 will not help our argument to management to expland the line anytime now. We really needed to at the very least match 2011 (or evenj better grow a little) in order to make the case that the line should grow. Don't get me wrong, the line is VERY healthy, but growth potential is hindered by a reduction in out baseline. I'm disappointed to read that you're reconsidering some of these items for late 2012. They generally include stands, dio pieces, Weapons Paks, and now vehicles. The stands sold well the first time, the Weapon Rack sold well, and the WPs sold fast too. Assuming the Wind Raider sells out fast, history would show that all of the non-sub items sell well, and one of them for $40. Would a fast sellout of the Wind Raider help you reconsider cancelling these unannounced non-sub items for late 2012? No, additional items have nothing to so with how the Windraider sells. We base line explansions (abovce and beyond sub items) on the baseline of subscribers we get knowing how many total fans are "all in". Now that the number of subs for 2012 looks to be our lowest "all in" yet we will need to reconsider how many non sub items we do in 2012 as well as how many sub items we do in 2013. We've heard a lot of fans saying they backed out of the sub due to too many offerings and the total price tag on the sub. Much like other collector lines, fans vote with their purchase and the fewer "all in" baseline fans, the fewer items in total we can produce. I loved the pics that showcased the Eternia Towers. Who created those,as they are awesome and well done? also, what are the chances of creating those? I know the answer is probably no,But I had to try. Really magnificent. thank you. It was done by our fantastic model shop team who build backgrounds for our TV spots and retailer shows. They really went to town on this hand made one of a kind model. We will have it at Power Con as well! Would you consider doing a poll regarding Castle Grayskull? When and if we hopefully get one, would you consider revealing pictures (drawings or prototypes) of just the facade and an entire playset with the price for each and let us vote on which we'd like you to proceed with? And you wouldn't even have to promise you'd do whichever won the poll; obviously if the complete playset won the vote that doesn't guarantee those sales, but if just the facade won by a landslide it seems it would be a good heads up to Mattel that producing the full playset would be too much of a risk. We actually were going to look into this but now that sub sales have dropped compared to 2010 and 2011 we may have to hold off on any line explansions at this time. Maybe one day! Lots of people seem to be freaking out about the lowered production numbers and the fact that fewer subs sold this year. Can you alleviate fears (or confirm them) and let us know whether or not Mattel is still happy with the brand as a whole, or if recent developments indicate a shift in thought? The brand is going GREAT, and we are hitting the min number of baseline fan we need. But the lower overall sub sales for 2012 (compared to 2010 and 2011)have caused us to drop a few as yet announced non-sub items we were exploring for late 2012. Additionally the lower 2012 sub sales have caused us to reevaluate how many skus we will include in the sub for 2013. With the baseline going down signifigantly, it is a bit harder to justify to management any additional line explansions. TG: Will A-list characters be considered for the 2013 sub exclusive? Given that Shadow Weaver went against previous statements made about what characters would be made subscription exclusives, do you consider all characters on the table as far as the 2013 subscription exclusive is concerned? Meaning, could we see popular A-list characters like Ram Man become exclusives? I really hope not as I think it could hurt the line more than help it. Based on the lower then expected sales of the 2012 MOTUC sub (though still well above the min we needed), we are actually reviewing all of 2013 in terms of how many skus will be included now. A lot is in flux now that sub sales were signifigantly lower compared to 2010 and 2011 subs. With a lower "baseline" we have to reevaluate the 2013 line up. It was heavily reliant on what our baseline was of fans buying "anything". Glimmer, Frosta, Castaspella, Queen Angella and Madame Razz are without doubt the top 5 Rebellion members left since Adora/She-Ra and Bow have been done. Is there any chance that well see atleast 2 of those 5 important and popular ladies in 2012 or atleast 2 new monthly figure slots dedicated to POP ladies in 2012? Very excited to get to more POP girls, but our lips are sealed beyond Thunder Punch He-Man for now! How to get a job designing figures at Mattel? I'm sorry for posting basically the same question again, but I can't reply to that thread and it didn't really answer the question for me. I found nothing helping me at Mattel.com unfortunately. Since the type of work I do is with the designing of the figures (such as sculpting and prototype painting) I was wondering how to apply for a job like that specifically. Similar to what the Four Horsemen do. I know they don't work for Mattel, they just work freelance for Mattel. I guess if I were to be really specific, let's say prototype painter. How would one get a job doing that? I know that a lot of toy companies get freelance prototype painters (such as the late great Ed Wires) so how would I even begin to get a job like that with a company such as Mattel? I've been self employeed for a long time now as a freelance artist and action figure customizer, but I've never freelanced for a toy company, but I would really like to. Any information would be greatly appreciated Scott. Thank you in advance. Mattel is always looking for the latest talent. Head over to Mattel.com and click on Careers for any open positions and how to apply. Black Evil Lyn cape for future weaons pak? Was wondering if there was a chance to get a black Evil Lyn cape in a future weapons pak to use for our 1st edition Lyn? Always possible now that we have the tool, but nothing is set right now. Prince Adam - Quarterly Variant? Thanks for the answer about Prince Adam. But "IF" he comes in the future, will he get a quarterly variant slot ? Since he has not filled the monthly slot, technically he should come in that right ? He may not have had a "monthly slot" or a single card, but we did do him already. He came with Orko in a 2 pack. So he has been done. Can We Expect A Single Carded Prince Adam In Filmation Colours? Since Prince Adam has not got his "official" (Single Carded) release & since now you have the Filmation rights, can we expect his single carded version in Filmation colours ? NO ! I am NOT asking him in "less detailed, animated version" like in the cartoon. It’s the same 2010 classics figure in Filmation colours (i.e. Pink Vest) & with new accessories (i.e. Filmation Sword, two new heads ETC) ! 1) It’s NOT just a “Repaint” Figure & it’s more than a Re-Deco (ALL fans will be happy) ! 2) One more Fimation Figure (Cartoon fans will be happy) ! 3) Single Carded Prince Adam in a monthly slot (Like King Graykull 2.0 Re-Deco) ! 4) New Filmation Accessories (Again, like KG 2.0's Orb) ! 5) NO MORE “Prince Adam Falling Down” Since he’ll come with super tight ankle joints (Vikor Boots ) ! 6) 2010 (Orko’s) Prince Adam SDCC Exclusiveness will remain forever ! Certainly something we can look into if their is enough fan demand for repaints in Filmation colors as quarterly variants, but nothing like this is planned at this time for the immediate future. Filmation A-List style Varients in MOTUC's Toy Line? I was wondering if as an A-List Varient in the MOTUC line You and the Horsemen could give Skeletor a more Filmation look in classics style. I bought this custom Sculpted MOTUC style Filmation Skeletor head from a He-Man.org member, sculpter/customizer from Germany. 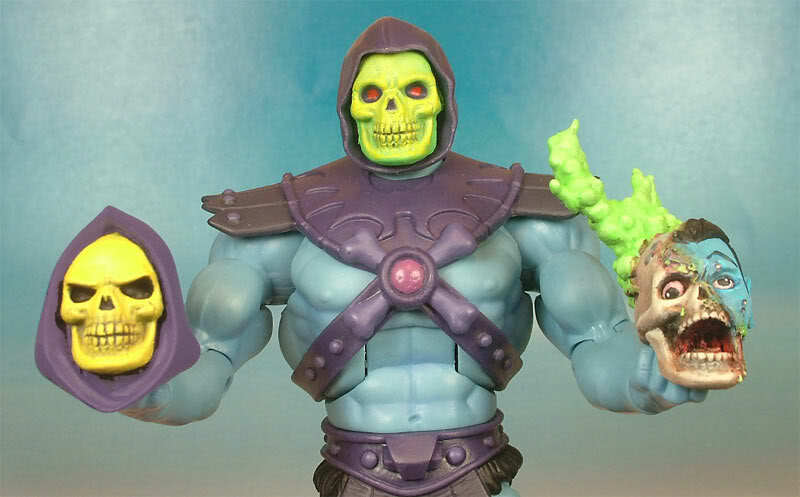 My thinking is this and it's a simple change to make a fimation style Skeletor in the Classics look. Just change the clawed feet for correct colored purple booted feet(no new tooling) and the horsemen sculpt a new head with the correct shaped style hood and scowl face of the Filmation skeletor. (If you look close the shapes of the skull faces they are almost exact MOTUC and Custom, just a filmation style hood and eyes shaped for skeletors scowl) The tooling would be very little and you get a brand new Skeletor that everyone will want. See enclosed pic. Filmation classics style head on left. Honestly I'd love to know what fans think. For the most part I have gotten the impression that fans want more then a repaint or kitbash for the quarterly variants. If their is enough fan demand sure, I suppose something like this is possible. What we won't be doing is a separate animated style line. But if their is enough fan demand and if fans are okay with it, doing Filmation repaints could potentially fill a quarterly slot. Let us know what you think! Can You Reconsider Doing a Head Pack? For a while fans have been asking for a pack of Classicized 200X heads (Skeletor, Buzz-Off, Grizzlor, Roboto, Clawful) and now fans are asking for Classicized Filmation heads. I don't think it's realistic to expect full redecos of all these characters without taking Classics off course (I for one would rather see the variant slots used for more interesting characters like the two Battlegrounds), so it seems like a yearly head pack would be a great way to make a lot of people very happy. Since there is more demand for something like this now, is it any more possible than when you've addressed it before? We just don't have the resources to do this. Heads are a lot of tooling and deco and it would take too many resources away from the line. I know fans want this but it just is not something we can offer. We will try to sneak extra heads in where we can (Demo-Man's comic book Skeletor head anyone?) But don't look for an all heads back. It isn't in the cards regardless of demand or requests. Additionally, design management specifically asked us not to do this as a pack of heads felt morbid. I did pitch it and reviewed it with the team. Despite demand, don't coun't on this one happening anytime soon. Sorry. Please don't reduce accessories/deco on Draego Man. Even if it means that he is going to cost $25 instead of $20. He's one of the biggest gains in MOTUC 2012 and am willing to pay extra to get him as shown at comic con! We're still exploring how to bring him into cost. I can tell you we will not be changing the price. He will remain a 20.00 figure. If we do have to cut accessories it doesn't mean we can't release those later in some other way. Just wondering how the extension pieces are going to work on tallstar - more to the point, if one were to purchase multiple star sister sets, would the extensions be stackable, therefore making a more elongated tallstar? Terry is still working on this. We'll update everyone once it is final. I've seen alot of fantastic MOTU artwork from the fans and some of them are really good (Matty Member Kev E Faces comes to mind). I think that adding art like this to the *White Mailer Boxes* would be a really cool way spice them up a bit and make collecting the classics line feel even more special. It is a cool idea but we have so few resources and logistics for the MOTUC line that we are putting it all into the figures themselves at this point. With Dark Horse producing the first 3, are there plans for more? If so how do I get in consideration? At this time the program is limited to 3 issues. Dark Horse provided choices for the talent. If you are interested in working for Dark Horse comics you will need to contact them! Let this serve as a universal answer for ALL Filmation characters in the classics vintage He-Man and She-Ra cartoons. Yes, we can do that character but that character will be done in classics style, not an animated style. All characters in MOTUC will be in one "classics" style. I understand you don't currently have the rights to all Filmation library, but are you considering the possibility of acquiring the licenses of Blackstar & Bravestarr? These characters still have many fans & have been often requested on the forums. Maybe you could run a pool on Matty frontpage or on Facebook to test the financial viability of these potencial lines? Sorry, we do not discuss new rights to any properties publicly. As of March 2012, after almost 3 1/2 years, we will only have had 2 NA figures released. Is this the precedent, or will there be more vintage NA figures sprinkled into the line per year? To be fair, the first year and a half was really about seeing if even the vintage MOTU line figures were enough to keep a collector line going. Once we got to 2010 we really started hitting all the segments/teams. Never fear, NA is a segment we will hit. Fans always tend to "want" whatever is not offered right this moment. Remember when all fans wanted was more females? Now look how many are coming in just the first quarter of 2012! Since we have MOTU Filmation rights, will we expect to see Imp or is he too animated? Like all Filmation characters we could do him in Classic but we would do him in "classics" stlye. We are not doing a separate anated line at this time. Now that we have Orko and FILMation is do-able, is there a possibility of a new SKU for smaller characters or even two packs of Trollans? Would we see a possible variant of Orko or is he more of a one and done character since he was a Comic Con exclusive? We're not going to be doing a separate animated style line. All figures regardless of source material will be in "Classics" style. So yes, Orko is pretty much done. Um, cause they are the "Star Sisters" and a natural trio. Nothing deeper. But what about changes to the colour colour scheme? Is there any chance we could see Jewelstar a bit less pinkish but more reddish in January? The colour of the vintage prototype was much more pleasing referring to its photo. And some more red plastic pellets during production shouldn't be a big deal. At this point the sisters are pretty set based on the paint scheme created by the Horsemen. Will you guys do more 2002 characters next year? Yes, you will continue to see characters from the 2002 line (ideally) every year in MOTUC. Are We going to get a Sorceress Teela (further down the line) as depicted in the SDCC Mini comic or will another Sorceress variant (NA look, 200X look) will be THE Sorceress Teela figure? Only time will tell! We can not comment on any figures past Thunder Punch He-Man at this time. Would Filmation colored MOTUC variants with realistic Filmation heads be out of the question? I'm not talking an animated look like JLU or Young Justice, but a repaint with new parts. For example, making a He-Man repaint that has Buzz-Off dark skin and in the Filmation colors, but has a Filmation head, Filmation blue harness, blue scabbard on his back, a longer Filmation style sword and a repaint of the regular power sword to those Filmation colors. We aren't going to do an animated head on a Classics style body. No sofa beds. To do an animated line we would need to do a full on new line and right now we are putting all of our resources into Classics. Can We Expect A "TRUE" 200X Evil-Lyn In The Future ? While many of us have the love for BG Evil-Lyn, It should also be noted that many of the fans were disappointed, since it was not her "TRUE" 200X variant ! Since some 200X elements were used on BG version & since we are going to get it in November, does this mean "The End Of The Road" for Evil-Lyn variants in the future ? Potentially, I still believe that we can expect another two variants of MRS.Skeletor. 1st one is Filmation Colours Evil-Lyn & 2nd one is "TRUE" 200X Evil-Lyn !! I know that you can’t satisfy all. But more than anybody else in this world, you know that Evil-Lyn is SUCH an IMPORTANT character in MOTU line & she definitely deserves a figure on female buck 2.0 !! Similarly, her filmation version’s skirt design is a perfect candidate for twist waist feature on female buck 2.0 !! We certainly could do additional versions of Evil Lyn down the road. We can confirm their is not a new Evil Lyn in 2012. You announced that it will be 4 (+1) Female Figures in 2011 ! We already know that there will be 5 in 1st Q of 2012 !! So, How many are left in 2012 ??? Almost every toy line will have females in it. Voltron has the Princess, GB has Dana and MOTU has the Star Sisters and Sorceress already revealed. How many will show up the rest of the year remains to be seen! Since the Star Sisters will be our 1st 3pack in Classics lineup will there be 3 different bios on the back of the box talking about them separately or will there 1 bio entire telling the story of all 3 of them??? We actually considered both options and in the end due to space limitations on package went with one bio for all three sisters similar how there is one bio for both Royal Guards. Most of the bio (like almost all bios) is based on vintage licensor kit material. Not to worry. No one will be double charged. We are well aware of this issue and an email will be sent out shortly clarifying the issue. This was due to an error on Mattel's part not listing Man E Faces as the monthly figure. DR had to then refund the original charge and charge again for Megator and MEF. It will take a day or so but all will be rectified. Look for an email and a posting shortly explaining in more detail. Why Bubble Power She-Ra Features The "Side Split" Skirt Design ? I can understand that it was done for improving her leg articulation (IE. Sitting Pose). But what I don’t understand is, why BP She-Ra has to get such a treatment when Catra’s skirt design allows her a perfect sitting pose without such modification ? The cuts on side of She-Ra’s skirt gives a "custom" feel to the figure !! Can You clear this ? This was done to allow her to sit on Swiftwind correctly. What Are Your Plans For CORE Filmation Characters? Being a die-hard MOTU fan that you are, It is needless to say how much love the fans have on CORE Filmation accurate characters like He-Man, Skeletor, Evil-Lyn, Teela, Mer Man ETC ! You know....Many of us wanted them for years!! But since we've already had their MOTUC versions, How can we expect them from you ? Say, fans are demanding for a filmation accurate Skeletor (with that AWESOME Havoc Staff) So, can we expect him as a new & complete figure like any other OR will we be getting an "Exclusive Filmation Accessories" (with brand new parts like Cartoon Skeletor Head, sharp edge boots, filmation havoc staff ETC) pack for upgrading MOTUC Skeletor ? All characters will be done in the Classics style. So any Filmation characters like Icer, Batros, Sea Hawk etc... will be translated from their simplistic animated design into the Four Horsemen Classics design. (look at Shadow Weaver as an example). Their are no plans at this time to do a seperate animated line or to do "main" characters like He-Man in a new simplified animted/Filmation version. All character whether from the vintage toy line, Filmation, MYP, mini comics or anything else will all be in the same "Classics" style.